Audiences will now have an additional opportunity to experience the second chapter of the Harry Potter Film Concert Series with the Des Moines Symphony performing John Williams’ music from the film live to picture. Tickets available now at DMPA.org. (May 11, 2018 – Des Moines, IA) – The Harry Potter Film Concert Series returns to the Des Moines Civic Center with Harry Potter and the Chamber of Secrets in Concert, the second film in the Harry Potter series. On January 25 & 26, 2019, the Des Moines Symphony will perform John Williams’ unforgettable score live from Harry Potter and the Chamber of Secrets while the entire film plays in high-definition on a 40-foot screen. 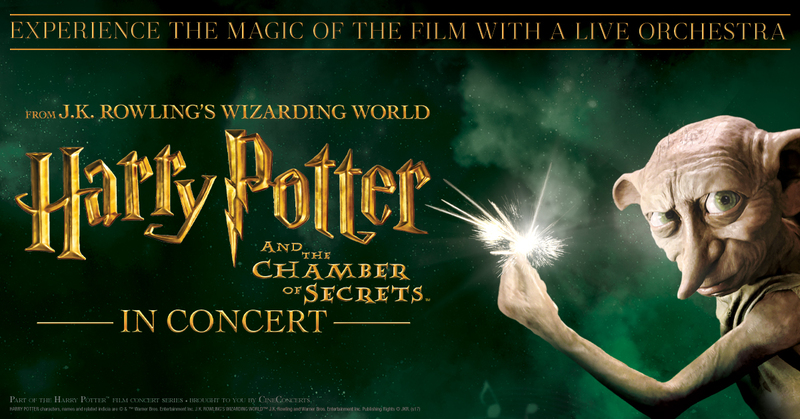 The show times are January 25 at 7:30 p.m. and January 26 at 1:30 p.m. and 7:30 p.m.
For more information on the Harry Potter Film Concert Series, please visit https://www.harrypotterinconcert.com/.